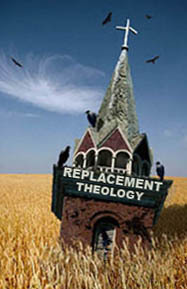 Is Replacement Theology Biblical? What is the truth? This forces us to reconsider the power of Galatians 6:15: “For in Christ Jesus neither circumcision nor uncircumcision avails anything, but a new creation.” Bruce, although he still posited the full arrival of the New Creation in the future, commented on the force of Galatians 6:15: “In the old order of the law, where distinction between Jew and Gentile was of fundamental importance, it mattered greatly whether a man was circumcised or no; now, it is totally irrelevant” (F. F. Bruce, New International Greek Text Commentary, Galatians (Carlisle, Eerdmans, Paternoster, 1982)273). Galatians 6:15 falsifies Pentecost’s claim that God was concerned with Abraham and not Torah. Where did circumcision come from, from Torah, or Abraham? Patently from Abraham (Genesis 17). Even though the Abrahamic Covenant, including circumcision, was given 400 years prior to the giving of the Law of Moses, it is undeniably clear that the covenant of circumcision was subsumed into the Law of Moses– maintaining that Abrahamic Covenant under the umbrella of Torah. Circumcision was not “the Law of Moses” distinct from the Abrahamic promises. The Law of Moses incorporated the Abrahamic Covenant into Torah. Thus, there was an organic unity between the Abrahamic covenant of circumcision and Torah, but, the Abrahamic promises would not and could not be fulfilled under or through Torah (Galatians 5:20-21). Those promises would be fulfilled at the end of Torah, when the Abrahamic Inheritance would be given (Galatians 4:1f). 2. That to which the Abrahamic Covenant pointed (and typified) was now becoming a reality, and the typological, foreshadowing symbols of the Abrahamic Covenant, i.e physical circumcision, was now coming to fruition! But, with the fulfillment of the type and shadow, the shadow was always intended to pass– through fulfillment. In Galatians, Paul posits the inheritance– the Abrahamic inheritance – at the end of Torah. The law had been given as the “guardian” to deliver the Abrahamic blood line to the time of the reception of that which Abraham looked, the heavenly city, the heavenly “father land” (i.e. the New Creation) of Galatians 6:15! The fact that the New Testament writers anticipated the passing of the old system and the arrival of the new – along with the nullification of circumcision – shows that Old Israel was not God’s determinative purpose. The OT prophets went so far as to say that the time was coming when the old world would not even be brought to mind, in comparison with the work that God was going to do (Jeremiah 3:14f; Isaiah 434; 65:19f; cf. John 4). These hardly strike one as predictions of the re-establishment of that old world. We will explore that in our next installment, as we refute the Dispensationalist’s false charge of Replacement Theology. Which book or books includes this article’s information and more? Steve, I do not have the book on this ready just yet. I am working on it, along with two other major projects. Previous Previous post: Replacement Theology #13| Israel the Shadow of Better Things! Next Next post: Was The Day of Pentecost the Day of the Lord of Joel 2?